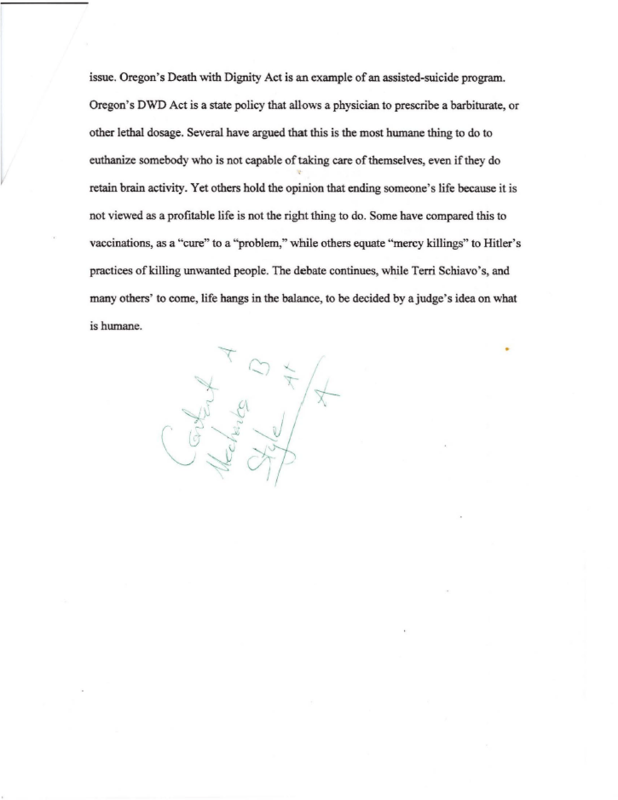 I found another school assignment from highschool, this time a journalism piece for my English/literature class. We had to write a “news article” about a current event. 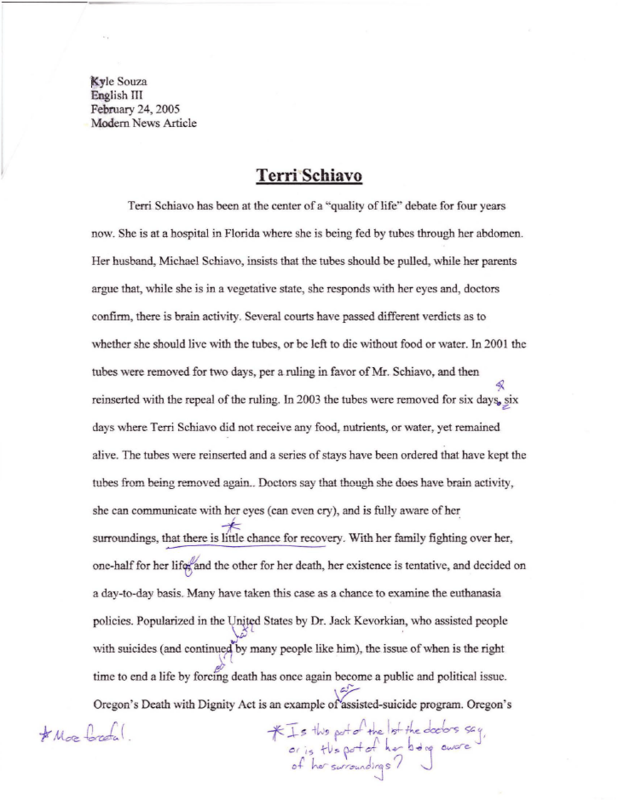 Being that this was back in early 2005, and my family caring about the kinds of things we care about, I chose the Terri Schiavo case. 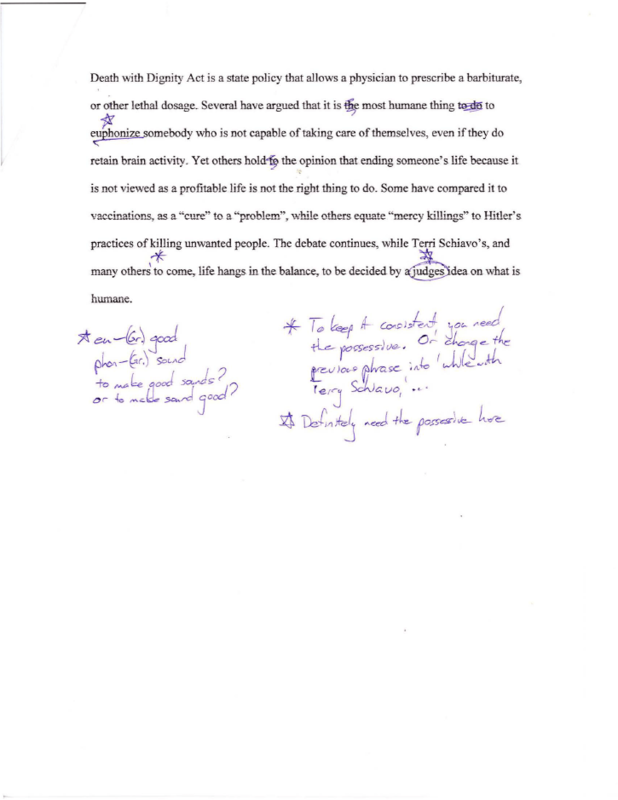 The images of all three drafts (with teacher markup) are below. By the end of it I did receive an “A”, this was not a forecast of my final grade for that class… Enjoy! 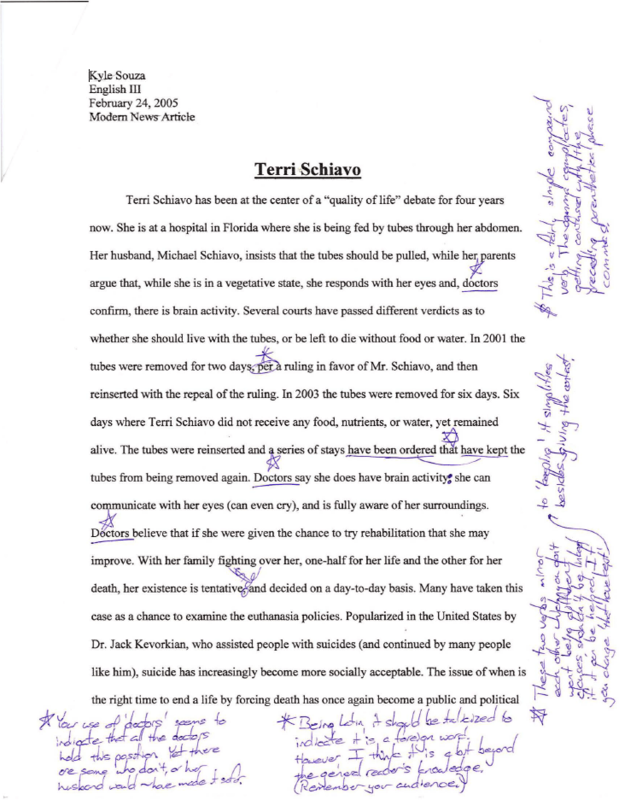 Terri Schiavo has been at the center of a “quality of life” debate for four years now. She is at a hospital in Florida where she is being fed by tubes through her abdomen. Her husband, Michael Schiavo, insists that the tubes should be pulled, while her parents argue that, while she is in a vegetative state, she responds with her eyes and, doctors confirm, there is brain activity. Several courts have passed different verdicts as to whether she should live with the tubes, or be left to die without food or water. In 2001 the tubes were removed for two days, per a ruling in favor of Mr. Schiavo, and then reinserted with the repeal of the ruling. In 2003 the tubes were removed for six days. Six days where Terri Schiavo did not receive any food, nutrients, or water, yet remained alive. The tubes were reinserted and a series of stays have been ordered that prevent the tubes from being removed again. Doctors say she does have brain activity, she can communicate with her eyes (can even cry), and is fully aware of her surroundings. Doctors believe that if she were given the chance to try rehabilitation that she may improve. With her family fighting over her, one-half for her life and the other for her death, her existence is tentative and decided on a day-to-day basis. Many have taken this case as a chance to examine the euthanasia policies. Popularized in the United States by Dr. Jack Kevorkian, who assisted people with suicides (and continued by many people like him), suicide has increasingly become more socially acceptable. The issue of when is the right time to end a life by forcing death has once again become a public and political issue. Oregon’s Death with Dignity Act is an example of an assisted-suicide program. Oregon’s DWD Act is a state policy that allows a physician to prescribe a barbiturate, or other lethal dosage. Several have argued that this is the most humane thing to do to euthanize somebody who is not capable of taking care of themselves, even if they do retain brain activity. Yet others hold the opinion that ending someone’s life because it is not viewed as a profitable life is not the right thing to do. Some have compared this to vaccinations, as a “cure” to a “problem,” while others equate “mercy killings” to Hitler’s practices of killing unwanted people. The debate continues, while Terri Schiavo’ s, and many others’ to come, life hangs in the balance, to be decided by a judge’s idea on what is humane. Terri Shiavo and her mother. 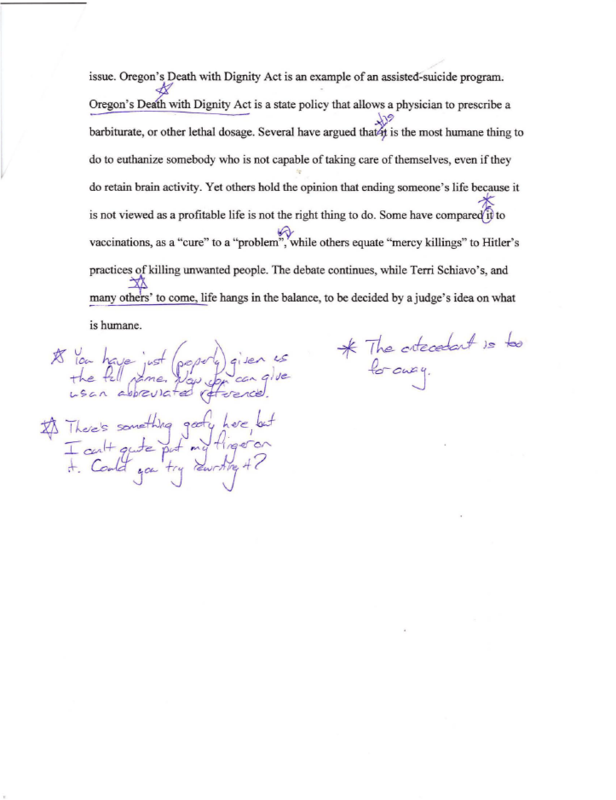 My favorite note from the teacher (on the second draft) is “There’s something goofy here…” – story of my life. Click an image to see a larger version and read the notes – if you dare care are interested in that kind of thing!